There are many channels through which customers online can connect with your business such as email, phone or live chat. In order to provide great customer support service, the business needs to reduce the effort of the customer to the maximum. This is where services like live chat solutions have an edge over phone or email because live chat instantly connects the customer and business, providing a transparent, quick and effective touch point with the customer. Thanks to a survey by softwareadvice.com that backs my claims, I can show you why business should use Live Chat more than phone service for their customers online. The best target audience for live chat, as given by the report from the survey shows that the best target audience for live chat are age groups between ages 18-44. This shows that businesses interacting with customers between this age group can get the best out of Live Chat. LIVE CHAT V/S PHONE: B2B OR B2C? On B2B communications, you have a different sales and support cycle. When it comes to web-traffic, according to bizreports.com, B2C companies have more traffic than a B2B solution, which makes converting on B2B more critical than And although B2B companies online touch point with a customer via email or phone, they can speed up the process with a simple live customer service application online. I’ve personally observed B2C using live chat more for support than for sales. In this industry, traffic is always relatively high and companies aim at making the customer experience as quick and as simple as possible. Phone support is more dominant in the B2C market, but like I mentioned, this industry uses live chat on pages like the ‘Shopping Cart‘ or on payment channel Using a Live Chat acts as a simple and quick touch point with your customers. So depending on the volume, you can make a decision on whether you want live chat or the phone support. 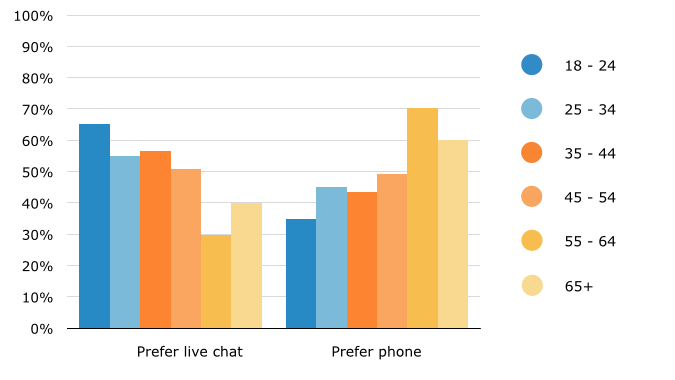 Looking at the results below you can tell that live chat is preferred for convenience and low hold time. Live Chat is very easy to use for a customer with simple queries about your product or service. Live chat is only a click away from your customer, which makes your support online easier to reach. The customer may reach out to you for queries as simple as pricing or delivery, based on the service or product you offer to your customers. Using the phone to contact your business on the other hand, involves more effort from the customer’s side. In the case that the customer had to make an international call, there would be more hesitation when it comes to reaching out to your business. Live chat bridges this gap, making it easy for the customer to communicate to the business, right through your website. 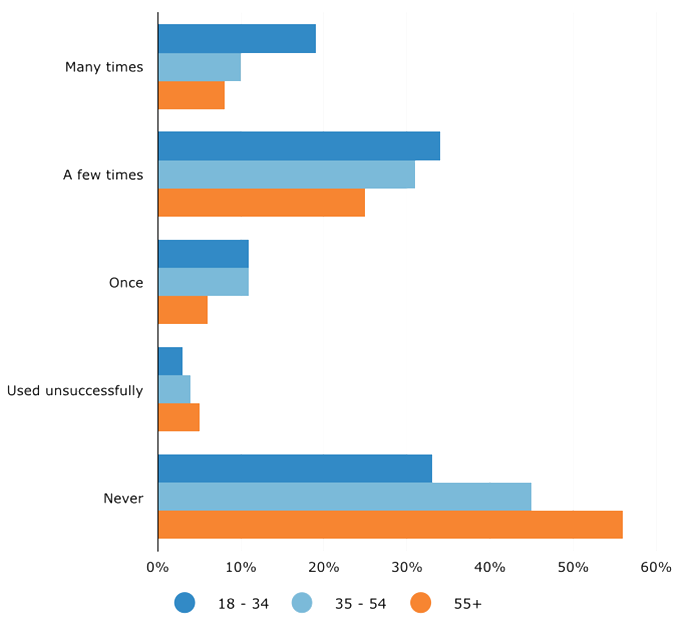 From the chart you can see that 61% of customers between the ages of 18-24 and 65% between the ages of 25-34 prefer live chat to phone for simple queries. In this graph you can easily make out the difference in age group when it comes to preferring live chat to phone for shopping queries. 65% of shoppers between 18-24 and 56% between the ages of 25-34 prefer to use live chat for shopping complaints! Jared Staver of the Staver Law Group in Chicago said that many of his potential new clients prefer live chat over the phone as it was a little less direct. * Being an online service channel, live chat meets customers exactly where most of them seek pre-sales product information and post-sales support. Because of this, receiving support via live chat requires considerably less effort for most customers than phone or email support. * On the business side, it eases the first point of contact with any prospective buyer and provides live support to existing customers. * Companies with customers in the age bracket of 18-45 (same age group that responded well to the survey) consistently express success with their implementations. But even more noteworthy is that companies with customers in the highest age range brackets also report success. What would you prefer as a customer? Live chat or phone support? Feel free to share any of your previous experiences with a live chat service! 1CLICK is a live chat service that provides video, voice and text chat. With a forever free plan, 1CLICK aims at connecting businesses and customers online across the globe, and replacing traditional phone support online. This entry was posted on February 26, 2015 by Clifton Lobo in Technology.